Textured Jewelry - This is a handcrafted pair of elegant dangle earrings created from textured and high polished strips of sterling silver that are accented by oval green and blue Azurite cabochon gemstones. Shown pierced, but available as clipped. 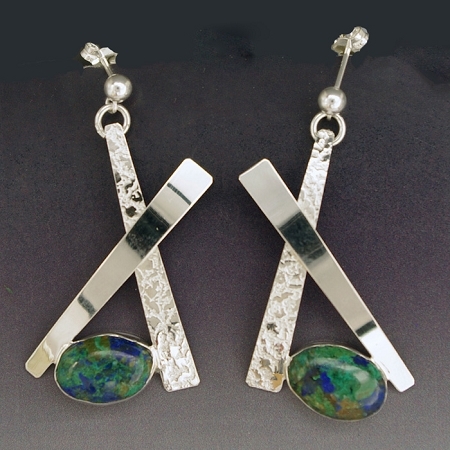 These earrings have textured silver with contrasting high polished silver, post type, with an oval azurite cabochon. Clip on style also available. These earrings are signed and created by Aaron Rubinstein of Modern Art Jewelry.